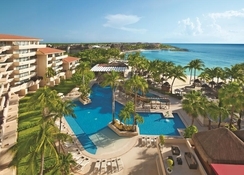 Enjoy an adventure-filled family holiday at the Dreams Puerto Aventuras Resort & Spa, one of the best all inclusive resorts in Cancun. With a gorgeous stretch of private beach and views overlooking a yacht-filled marina and Caribbean Sea, this luxury resort in the village of Puerto Aventuras is a hot spot for R&R. The resort offers two swimming pools (plus a separate adults only pool), Dreams Spa by Pevonia, a fitness centre, gym, extensive watersports, yoga classes, a mini-golf course, Kids' Clubs, a Dolphinarium, access to the Gold Palm Certified Diving Centre, and much more. 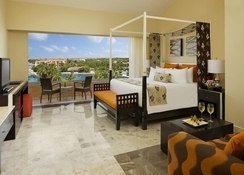 Dreams Puerto Aventuras Resort & Spa features 305 modern, chic rooms and suites with all the necessary amenities, suitable for couples, families, and solo travellers. Explore the gourmet dining and drinks scene thanks to the resort's variety of restaurants and bars, available day and night with the hotel's Unlimited-Luxury privileges. 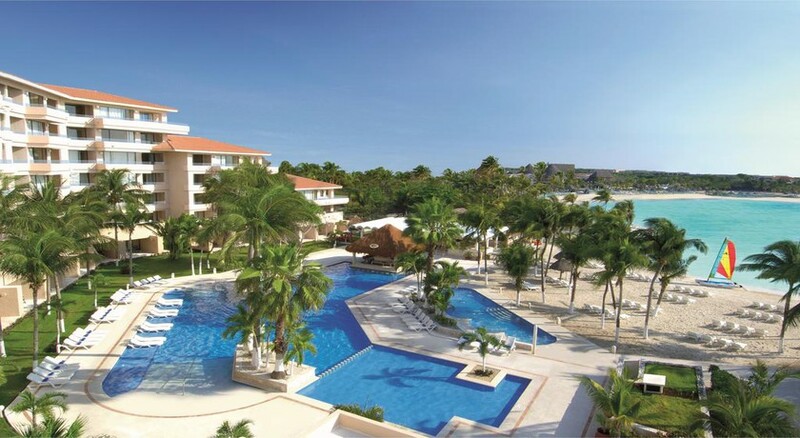 Located on a private stretch of beach, overlooking the glittering marina in Puerto Aventuras, Dreams Puerto Aventuras Resort & Spa is 15 minutes south of Playa Del Carmen and approximately one hour south of Cancun International Airport. The hotel features 305 rooms. All rooms offer modern amenities including air-conditioning, private balcony or terrace, flat-screen TV, mini-bar, coffee & tea maker, in-room safe, clothes steamer, bathrobes, slippers and hairdryer. 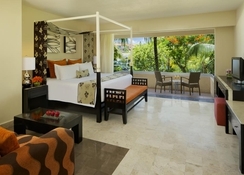 Guests can choose rooms between Deluxe Garden View, Deluxe Pool View, Deluxe Dolphin View, Deluxe Ocean View, Honeymoon Jacuzzi Dolphin View, Master Suite Ocean View, Family Suite Deluxe Garden View and Family Suite Deluxe Ocean View. There are five reservation-free restaurants. World Café is the hotel's main buffet restaurant serving International dishes and open for breakfast between 7am – 11am, lunch between 12:30pm – 3pm and dinner between 6pm – 11pm. Portofino is a specialty Italian restaurant open for dinner between 6pm – 11pm. El Patio serves authentic Mexican cuisine and is open for dinner between 6pm – 11pm. Oceana is an adults-only seafood restaurant open for dinner between 6pm – 11pm. Gohan is a specialty sushi lounge open for dinner between 6pm – 11pm. Seaside Grill and Barefoot Grill both serve grilled snacks and meals. Seaside Grill is open for lunch between 11am – 5pm and dinner between 6pm – 11pm. Finally, Barefoot Grill is open daily by the pool. Coco Cafe is open 24 hours and serves specialty coffee and late-night snacks. 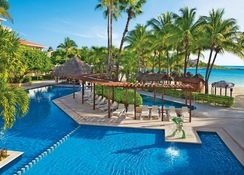 There are four additional bars including Manatees - a swim-up bar in the adults-only pool area. There are two swimming pools including a separate adults-only pool and 30-person beachside jacuzzi, a fully-equipped fitness centre and Dreams Spa by Pevonia offering a range of treatments & therapies at an extra charge and includes beauty salon, steam bath, sauna, specialist kids and teen treatments. The hotel offers sport and wellness activities like aerobics, yoga, volleyball, ping-pong, bocce ball, cycling, Euro-bungee, mini-golf in addition to dance, cooking and Spanish lessons, board games. Non-motorised water sports including sailboats, snorkelling, kayaks, windsurfing, ocean trampoline, ocean-climbing iceberg and introductory scuba diving lesson in the pool. The hotel also provides complimentary green fees at a nearby golf course. Lay back for big-screen movie screenings on the beach, regular evening entertainment including live shows and theme nights. Dance your heart out at the weekly cocktail parties organised by the hotel. The on-site dolphinarium offers three levels of paid-for interaction with dolphins. The dress code at this hotel is Casual Elegance, which means trainers or sandals and dress shirts with short sleeves or shirts are required. Long trousers are required for men. No sleeveless shirts or flip-flops allowed.